Grand Crue is a blend of several different beers from Sebago Brewing Company and the combination of these beers makes a very complex and tasty treat for anyone lucky enough to try it on tap or bottled. See notes from the brewer below for the combination of beers used for the 2012 version. This beer pours a very dark red with a slight tan head that dissipates quickly leaving just a small amount of lacing on the glass. Aroma has plenty of roasted malts, chocolate and some oak/bourbon, very complex. Taste follows the nose with lots going on and the flavor continues to change as the beer warms a bit. Carbonation is minimal but that does not take away from the experience on this beer. Overall this is a very nice blend of other Sebago beers and something I would recommend you try. 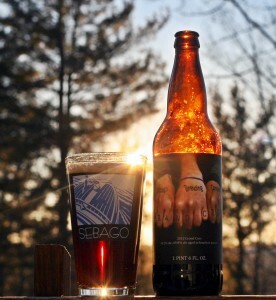 Brewers Description: Sebago Brewing Company Grand Crüe (6.4% ABV) is a celebration of the art of brewing. Our 2012 edition is a blend of four distinct beers: barrel-aged Slick Nick Winter Ale and barrel-aged Midnight Porter, fresh Lake Trout Stout and Barleywine. Each beer adds its own complexity to the mix, from the vanilla and oak notes of the two bourbon barrel beers, to the roasted malt of fresh Stout and the chocolate, toffee-like notes of our Barleywine. The result is an intensely aromatic and malty beer with a surprising hop bitterness and a dry finish. Celebrate the holidays with a glass of this exclusive single-batch offering. Grand Crüe is a limited release, available while supplies last on draft and in 22oz bottles at all Sebago locations.